Along with the announcement of Disney's acquisition of LucasFilm which included Star Wars, came the news no one thought would happen, the plan to create a seventh entry in the Star Wars film series. Set 30 years after Return of the Jedi, very few plot details are known so far, but it will include Harrison Ford, Mark Hamill and Carrie Fisher. But while we're all looking forward to Episode 7, its announcement has had a major impact on the Star Wars Expanded Universe; the extended tales of the series that many of us have enjoyed through novels, games and comic books over the years. Now 99.9% of these adventures are deemed non-canonical. So while the slate has been more or less wiped clean aside from the existing 6 films in the series, this only means that Star Wars fans should be expecting new, interesting and canon content from here on out. However long before Episode 7 is released, Disney have already kicked off their take on the Star Wars universe. In the wake of the demise of The Clone Wars, a new series has risen from its ashes. Called Star Wars: Rebels, this new series opens with a feature length first episode. But the question is, is it any good? Out now on Blu-Ray and DVD comes Star Wars Rebels: Spark of Rebellion, a promising opening episode that proves Rebels will be your Star Wars fix until Episode 7. The series is set long after the events of Revenge of the Sith, and just five years before A New Hope. After Order 66 wiped out most of the Jedi Order, and with their protective force no longer in existence, under the control of Emperor Palpatine the Empire has taken control of the galaxy. Rebels charts the humble beginnings of the Rebel Alliance, the movement against the Empire that eventually led to the destruction of the first Death Star in A New Hope, and ultimately helped restore peace throughout the galaxy. 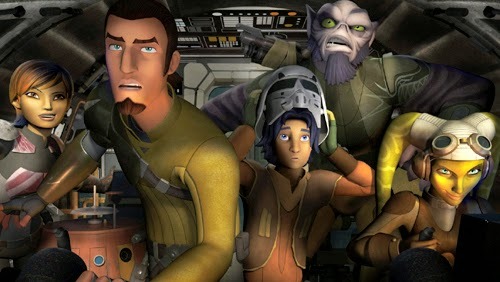 The series focuses on a young man named Ezra Bridger, an unknowingly force-sensitive orphan who meets a group of rebels aboard a ship called the Ghost. The crew are varied and diverse, and feature survivor of Order 66 Padawan Kanan Jarrus, Mandalorian warrior Sabine Wren, Zeb Orrelios, pilot Hera Syndulla and a droid named Chopper. This first episode's plot mainly revolves around rescuing Wookie slaves and the rebels' issues with the Empire, but ultimately serves as an introduction to a bigger, more elaborate turn of events that kick off with Erza meeting the crew of the Ghost. What I enjoyed in Rebels the most were the characters. Sure, you have your typical bunch of misfits, all of which kind of come across as various types of variations of Han, Luke and Leia. But compared to the cast of The Clone Wars, these characters, despite the likenesses to the original trilogies trio, are funny, interesting and highly watch-able. Then there's the action, which going solely by this first outing is classic Star Wars- fast, frantic, inventive and always done with a wink and a smile. I'm sure the series will veer off into some excellent dark material eventually, but for now the action, characters and plot is very much in line with the lighter elements of the Star Wars films. I'm just hoping that beyond showing us the creation of the Rebel Alliance, that Rebels can make its own mark on the Star Wars universe without relying on familiar characters we've seen before. Visually it looks like The Clone Wars. It's cartoon-ish, chunky and the play-doh looking character designs are highly recognizable, if a little bit too simplistic for my liking. Don't get me wrong, I didn't want dark, gritty and bleak visuals here, but I can't say I'm a huge fan of the overall character designs. That said, everything else looks the part which thankfully leads to Rebels being highly reminiscent of the original trilogy. From Storm Trooper outfits, the inside of a Star Destroyer and the appearance of TIE Fighters, this is the Star Wars world we all know and love, as opposed to the one tarnished by the prequels. This level of authenticity extends to the sound design too which is absolutely implacable, right down to the old familiar hum of the lightsaber. It may not look exactly like I wanted it to, but it feels like Star Wars, and that, I think, is something that should be celebrated, as I can imagine it's something that's quite hard to achieve. Overall Star Wars Rebels: Spark of the Rebellion is an excellent feature length introduction into this new series. Jam packed full of humour, action and, of course, a possible budding romance, Rebels shouldn't be discounted by any fans out there. Trust me, It feels like the Star Wars you know and love. This is the Star Wars TV series you are looking for. Star Wars Rebels: Spark of the Rebellion returns us to that galaxy far, far away and gets a 4/5.